Prof Earl L. Durham...was a Chicago activist and academic. He died in October 2007. Earl L. Durham was pre-deceased by his son, Claude Durham, his brothers, Richard Durham and Curtis Durham and his sisters, Winifred Holland and Marie Durham. He is survived by his three sons Gerald, Eric, and Jody, his brother, Caldwell Durham, his sister, Clotilde Smith and his sister-in-law, Clarice Durham. Earl Durham was the youngest child of seven born to parents who came to Chicago from Mississippi during the Great Migration of the 1920s. He worked as a waiter on the Illinois Central Railroad until being drafted during World War. After the War, Durham took advantage of the G.I. Bill and enrolled in college. He was a graduate of Roosevelt College and the University of Chicago and received his degree in chemistry, later working in a chemical plant. Durham later organized parents in Woodlawn and Hyde Park to pressure the Board of Education to improve Hyde Park High School so that parents of all races would want to send their children there. Over the next few years, Earl Durham made his living studying the psychopharmacology of substance abuse and serving as research director at a halfway house for ex-offenders and heroin addicts, where part of his job was to organize an advisory committee of community residents. Durham then made the decision to earn a master's degree at the School of Social Service Administration at the University of Chicago, and on graduation was hired by the School as a professor. The Abraham Lincoln School for Social Sciences was a Chicago institution of the 1930s and 1940s, run by the Communist Party USA. Faculty members were Morris Backall, Michael Baker, Frank Marshall Davis, Horace Davis, David Englestein, Morton Goldsholl, Pat Hoverder, Alfonso Iannelli, Leon Katzen, Ludwig Kruhe, Herschel Meyer, Henry Noyes, William L. Patterson, Fred Ptashne, Eleanore Redwin, Boris M. Revsine, Frank Sokolik, William Rose, Herman Schendel, Bernice Targ and Morris Topchevsky. A South Side annex to the school was is located at 4448 South Michigan Avenue, Chicago. Dr. Walter S. Neff was director. Instructors included Albert George, Charlie Mitchell, Lester Fox, Geraldyne Lightfoot, Ishmael Flory, David Englestein, Irving Herman, Earl Durham, Claude Lightfoot and Walter Miller. After WW2 Earl Durham was active in the Progressive Party. Earl Durham served in numerous leadership posts in the Communist Party USA. He was elected to the Communist Party National Committee at the Party's 16th National Convention held in New York City on February 9-12, 1957, at which time he was also chosen to serve on the party's 11-member national administrative committee. Durham was later designated as a member of the national executive board, which was established by the National Committee of the Communist Party to function between quarterly meetings of the National Committee. At a meeting of the Party National Administrative Committee in May 1957, Durham was named as youth affairs secretary of the party. He was subsequently appointed as one of nine party secretaries, who functioned as "a collective leadership" for the Communist Party USA. In January 1969, the Chicago radical newspaper, Hyde Park-Kenwood Voices, listed those who had helped produce its first 16 monthly issues as "writers, researchers, photographers, artists and clerical workers". The list included Earl Durham. In the 1950s Earl Durham was a national leaders of the the Communist Party USA youth wing, the Labor Youth League. Durham was identified in the Communist press in December 1957 as the Party's national youth secretary and in 1958 as a party national executive committeeman. During the period from 1950 to 1956, Durham served as a leader of the Labor Youth League. Among his various Labor Youth League assignments were chairman of the Illinois Labor Youth League, national councilman, national vice chairman, and acting national chairman. According to Jay Schaffner, Earl Durham was supportive of the W.E.B. DuBois Clubs of America and the Young Workers Liberation League. Earl was also the "eternal youth" to those of us of later generations in the Chicago youth movement - the labor youth movement, the socialist youth movement, and the young communist movement. Earl, along with others like Lou Diskin, were always there for those of us in the W.E.B. DuBois Clubs and later in the Young Workers Liberation League. According to Schaffner, Earl Durham was also a supporter of (Sam) A. A. Rayner, Jr. (and getting him elected as an alderman) and the movement that later elected Harold Washington and the movement that put Charles Hayes, the leader of the Packinghouse Workers into the Halls of Congress. Durham was a supporter and confidant of one of the nation's first African American elected mayors, Richard Hatcher in Gary, Indiana. While Earl Durham was a leader in the campaign to elect Harold Washington as Mayor, his brother Richard Durham was the Mayor's speechwriter. ...in the late 60s, when I was coming around, was grappling with how could the days' progressive and socialist movement be relevant to the reality that was the life of the African American community and working class in Chicago. For Earl this meant being amongst the first to broach the idea of a gang summit, and to work with the Blackstone Rangers, as they were, not as some or many would have wanted them to be. He was a supporter of the day's youth movement, always pushing us to be relevant, to be youth, not just "junior communists and socialists." When I moved from Chicago in the mid-70s, one of the things that I was giving up was the opportunity for regular consultation, talk, and friendship with Earl Durham. Even though it was more than 30 years ago, I can still vividly remember those exciting sessions in his classroom. He challenged us to confront the realities of community organization, and what it REALLY meant. He challenged us to confront our feelings about race, about class, about the gap in America between rhetorical words and deeds. In the 1970s, Earl Durham joined with Dr. Donald Moore as a founding member of Designs for Change, a group committed to changing the Chicago school system for the betterment of all students. Durham was active in writing the Chicago School Reform Act of 1988, which shifted decision-making and improvement efforts to the school level and created Chicago's unique Local School Councils. Circa late 1982, members of the Citizens Committee/Harold Washington for Mayor of Chicago (in formation) included Earl Durham. On April 6, 1983, the Hyde Park Herald published an endorsement from the Hyde Park/Kenwood Citizens Committee of Democratic Party Chicago mayoral candidate Harold Washington. Signatories to the endorsement included Earl Durham. In 1987 Earl Durham was a Member of the Executive Committee of Chicago based Comprand (Comprehensive Research and Development). In 1987 Earl Durham was on the Board of Directors of the Black Press Institute. On November 16, 1989, Earl Durham was listed as a friend of the Chicago Committee to Defend the Bill of Rights Tribute to Leon Golub and Lucy Montgomery, held at the Congress Hotel, Chicago. Timuel Black, Basil Clunie (co-chair), Earl Durham, Tommie Fry, Judy Hatcher, Tena Johnson, Toni Moore, Cheryl Johnson-Odim, Alice Palmer, Orlando Redekopp, Rachel Rubin (co-chair), Robert Starks, Lucille Teichert, Kevin Thompson, Tim Wright. In later years Earl Durham continued to work at the University, with Community Organizing and Family Issues (COFI). 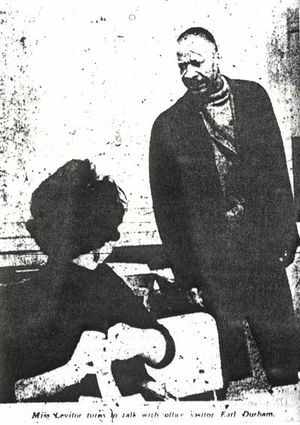 In 2005 Chicago Area Friends of SNCC organized the "Tell the Story: The Chicago SNCC History Project, 1960-1965" Chicago Area Friends of the Student Nonviolent Coordinating Committee and the Chicago Civil Rights Movement, c. 1960-1965. The event was held October 21-22, 2005 Roosevelt University, Chicago, Illinois. Durham was a member of the National Association of Black Social Workers and the National Urban League. He also served as a board member of the Chicago Area Project and vice president of the Board of Trustees of the Edward Hazen Foundation in New York City. This page was last modified on 3 February 2017, at 16:03.